I have been reading your review of Leanda de Lisle's book on your blog, A Trumpet of Sedition. 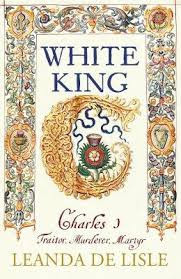 I would agree that it is not a particularly good book and that its attempt to defend Charles I's rule is by no means convincing. But I do not think that it can be described as a "revisionist" work partly because "revisionism" in early modern British history has been dead since c.1990. Its heyday lasted from c.1976 until the end of the following decade. Whig or whiggish history had effectively perished by the time of the Second World War and the Marxist history of Christopher Hill and his allies like Brian Manning was never as predominant as you, I suspect, might have wished it to have been. It was certainly more influential in the 1950s and 1960s but Conrad Russell's assault in the mid-1970s terminated its influence. On Friday, 23 November 1649 Thomas Totney, a puritan and veteran of the English Civil War, was working in his goldsmith’s shop at ‘The Three Golden Lions’ in the Strand. He was to claim that after fourteen weeks of self-abasement, fasting and prayer the Lord came upon him in power, overwhelming his wisdom and understanding, smiting him dumb, blind and dead in the presence of hundreds of people. Next his body began to tremble and he was tied down in his bed. During his indescribable sufferings he saw the Passion of Jesus. Then he was transported into God’s presence in the ‘High and holy Mount’ where he beheld a great light shine within him and upon him, saying ‘Theaurau John my servant, I have chosen thee my Shepherd, thou art adorned with the jewel of Exceliency’. 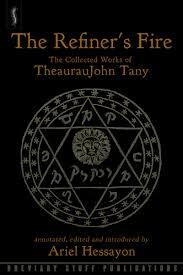 He was convinced that the Lord had spoken unto him, changing his name from Thomas to TheaurauJohn. Totney was baptized on 21 January 1608 in the parish of South Hykeham, Lincolnshire, the third but eldest surviving son of John Totney and Anne, née Snell. His father, although a poor farmer and never of the parish elite, was a respectable member of the local community. Nothing is known of Thomas’s education, yet it seems likely that by the age of seven he would have learned to read and by the age of nine, if his family could still cope without him, he would have learned to write. In April 1626 he was bound as an apprentice in London to a fishmonger but was not taught their trade. Instead he received instruction in his master’s adopted profession, that of goldsmith. On receiving his freedom he married a daughter of Richard Kett, a prosperous Norfolk landowner whose great-uncle had been executed as leader of the 1549 East Anglian rebellion; Kett’s uncle was burned for heresy in 1589 and his father imprisoned for the same offence. Rather than serving as a journeyman, Totney quickly established himself as a householder – a costly progression suggesting he received a charitable loan or financial assistance from family and friends. He set up in St. Katherine Creechurch, a location favoured by small retailers for its inexpensive rents, his shop marked by an unknown sign near Aldgate. 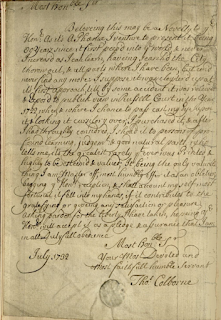 To ensure that Totney’s business activities fell within their orbit he was translated to the Goldsmiths Company in January 1634. However, along with the majority of ‘remote’ goldsmiths he resisted a Company initiative which had gained royal approval, to vacate his dwelling and relocate in Cheapside, the hub of the goldsmiths’ trade. Totney remained in St. Katherine Creechurch for another six years. There he heard the fiery sermons of Stephen Denison on the immutability of God’s decrees of predestination. It was a doctrine that troubled Totney until his epiphany. When his first son was born in December 1634 Totney refused to have him baptized, for which he was presented before an ecclesiastical court. Following his wife’s death he remarried by licence during Lent, probably on Friday, 25 March 1636. This was the first day of the New Year in the old calendar and his actions hint at a type of confrontational godliness and perhaps also zealous Sabbatarianism. Upon his father’s death in 1638 he went to Little Shelford, Cambridgeshire to manage the family farm. 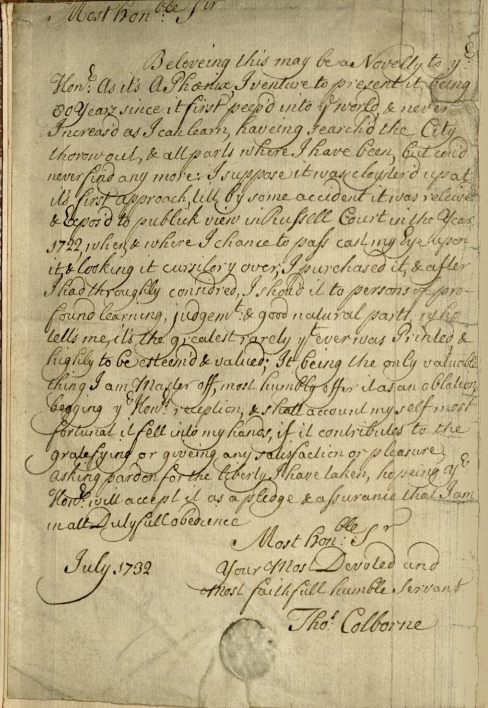 In the summer of 1640, probably while serving as one of the parish’s petty constables, he played an important part in resisting the collection of ship money. By his own account he was imprisoned in London and his horse distrained on the county sheriff’s authority. A series of payments in 1642 show his support for those opposed to Charles I. Moreover, he claims to have witnessed one of Captain Oliver Cromwell’s orations delivered at Huntingdon to newly mustered volunteers. Totney later possessed a great saddle, musket, pair of pistols and sword, suggesting he served as a harquebusier. By December 1644 he had returned to Little Shelford where he resumed his duties as a local tax official, as well as taking up sequestered land and providing quarter for Parliamentarian soldiers and their horses. Following the outbreak of a second Civil War, Totney uprooted. He rented out his lands to a local villager and moved with his family to St. Clement Danes, Westminster. In June 1648 his second wife died and was buried in the parish. but who may abide the day of his appearing? for he is like fullers sope, a refiners fire. feed the hungry, clothe the naked, oppress none, set free them bounden, if this be not, all your Religion is a lye, a vanity, a cheat, deceived and deceiving. 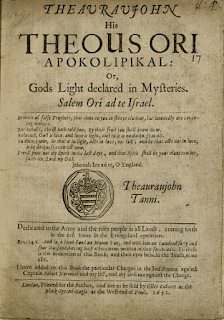 Tany’s first publication was a broadside entitled I Proclaime From the Lord of Hosts The returne of the Jewes From their Captivity (25 April 1650). It is likely that Captain Robert Norwood, a wealthy London merchant, paid for its printing. In early September 1650 Tany was at Bradfield, Berkshire at the same time as William Everard, one-time leader of the Diggers. There was bedlam. It was reported that the rector, John Pordage, fell into a trance while preaching and that bellowing like a bull he ran to his house. There Pordage found his wife upstairs clothed all in white from head to toe, holding a white rod in her hand. Moreover, an adolescent was said to have fallen into a very strange fit, foaming at the mouth for two hours. He dictated verses concerning the destruction of London and demanded to go there to meet a goldsmith. Tany next published two tracts: Whereas TheaurauJohn Taiiiiijour My servant (15 November 1650) and THE NATIONS RIGHT in Magna Charta (28 December 1650). Both demonstrated his earnest desire for social reformation, the latter exhorting the common soldiers to dissolve Parliament and call fresh elections. 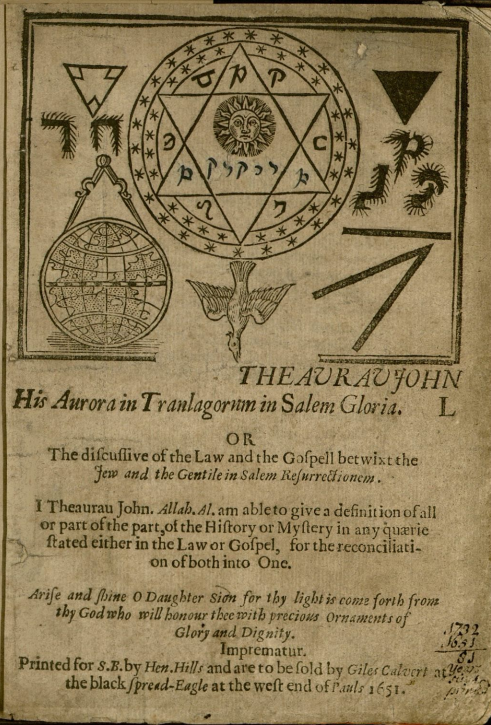 His next offering Aurora in Tranlagorum in Salem Gloria seems to have been written on three consecutive days in late December 1650. It was printed by a Baptist who had previously printed a ‘very dangerous’ book. The publisher was Thomas Totney’s brother-in-law. It was sold by Giles Calvert from his shop at ‘The Black-spread-Eagle’ at the west end of St. Paul's Cathedral. 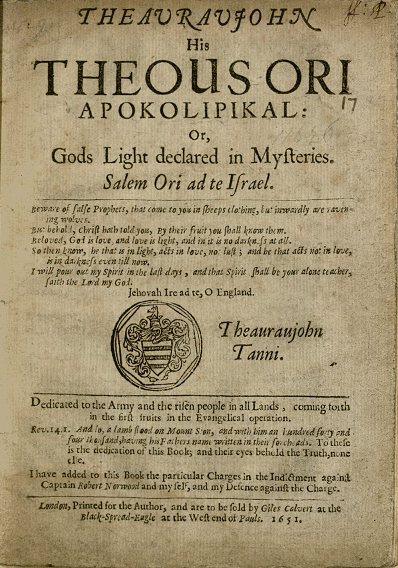 In January 1651 Tany wrote the first of the epistles that eventually comprised THEOUS ORI APOKOLIPIKAL (1651) and Second Part OF HIS Theous-Ori APOKOLIPIKAL (1653). On 6 March he was apparently brought before the Westminster Assembly of Divines, responding to their questions with thirty-seven of his own queries. Nonetheless, they accounted him mad. Perhaps shortly thereafter he forsook his trade. There is neither hell nor damnation. As their own accounts of the trial’s proceedings make clear, the defendants adamantly maintained that their words had been misrepresented, altered and taken out of context. Even so, on 13 August 1651 they were convicted jointly of blasphemy by a jury of twelve men at the London sessions of the peace held in the Old Bailey. They were each sentenced to six months imprisonment in Newgate gaol without bail or mainprize. Conditions for those that could not afford the services of the gaoler were apparently intolerable. there is ‘no Hell nor Damnation’, are not within the Statute, for tho by Implication if there be no Hell there is no Heaven, yet the court is not to Expand these words by Implication but according to the Letters of the Stat[ute]. Within a month of his release Tany published a pamphlet he had written in Newgate entitled High Priest to the IEVVES, HIS Disputive challenge to the Universities of Oxford and Cambridge and the whole Hirach. of Roms Clargical Priests (March 1652). Echoing Paul’s epistle to the Romans, Tany proclaimed the return of ‘Israels Seed’ from captivity. About 1 January 1653 it appears from his own account that Tany underwent another purificatory ritual. He refrained from speaking for thirty-four days, isolating himself for twenty-one of them. On the fourteenth day he transcribed an edict to ‘all the Jewes the whole earth over’, which was to be engraved in brass and sent to the synagogue in Amsterdam. He signed this proclamation with his new name and titles, ‘Theauroam Tannijahhh, King of the seven Nations, and Captain General under my Master Jehovah, and High-Priest and Leader of the Peoples unto HIERUSALEM’. Together with some other material it was issued by an unknown publisher under the title HIGH NEWS FOR HIERUSALEM (no date). It exasperated one reader, who complained ‘truly I skill not the man, nor his spirit; in his writing he offends against all rules of Grammar, Geography, Genealogy, History, Chronology, Theology & c, so far as I understand them’. XIX. 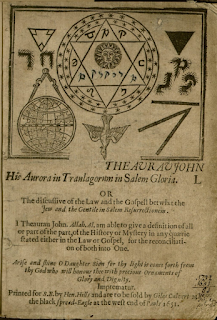 A Goldsmith that did live in the Strand, and after in the City, and then at Eltham; who called his name Theaurau John Tany, the High Priest, & c. Published in Print, That all Religion is a lie, a deceit, and a cheat. On the morning of Saturday, 30 December 1654, in the week that Cromwell was offered the crown, Tany solemnly made a large fire at Lambeth into which he cast his great saddle, sword, musket, pistols, books and bible. He crossed the River Thames in a rowing boat and made his way to Parliament, ascending the stairs into the lobby outside the door. Unable to deliver a petition he departed, returning after about an hour oddly attired with a long, rusty sword by his side. Pacing up and down the lobby he suddenly threw of his cloak and began slashing wildly, but was disarmed before anyone was hurt. He was brought to the bar of the House and questioned by the Speaker. He refused to remove his hat, was evidently mistaken for a Quaker and committed to the Gatehouse prison. Having been examined by the Committee for regulating printing, he wrote to the Speaker requesting liberty to have an audience with Cromwell. He then attached a great lock and long chain to his leg as a symbol of ‘the people of Englands Captivity’. Legal proceedings were transferred to the Court of Upper Bench but on 10 February 1655 he was bailed upon habeas corpus. Two days later a fire broke out in Fleet Street. In the following months London was engulfed by several more unexplained fires which were interpreted as a sign of the impending destruction of the world. Eventually an arsonist was apprehended who may have been in the pay of William Finch, one of Tany’s disciples. In September 1655, after weeks of heavy rain and widespread floods, Tany ‘in one of his old whimsies’ pitched his tent in the large tract of open ground between Lambeth Marsh and Southwark known as St. George's Fields. A satirical newsbook writer thought him ‘a madman’ fitter ‘for Bedlam then a Tent’. Wars, wars, wars, wars, wars, wars, wars. He crossed the English Channel successfully and at an unknown date arrived in the United Provinces, perhaps to gather the Jews of Amsterdam. Some three years later, now calling himself Ram Johoram, he was reported lost, drowned after taking passage in a ship from Brielle bound for London. He was survived by his eldest daughter and probably also a second daughter and second son. (Dr Ariel Hessayon's research interests include early modern ideas, religion, politics, literature and popular culture. Dr Ariel Hessayon is a co-convenor of the seminar on seventeenth-century British History at the Institute of Historical Research and would welcome enquiries from those interested in doctoral research in areas relating to radicalism in early modern England). 1 The images used in this article were given by kind permission of Harvard University, Houghton Library. Charles Spencer has spent the last few weeks touring the country publicising his new book To Catch a King. The basic story is of Charles II escape from parliamentary forces during the second civil war. The evening spent at Waterstones Kensington High street with Spencer was a pleasant one, and the event itself was well organised. The major problem I have in reviewing this event or his books is that we have opposed political and historical worldviews. That will not change. Having said that Spencer from a human standpoint is a kind man and a skilful narrative led historian.Aside from the rigour of his work he has a passion for history that is admirable in a historian. His book Killers of the King was the second highest selling history book in the UK in 2014. Spencer is a natural speaker almost like a raconteur. In fact, he speaks as he writes. His books are pure narrative, but that does not mean he is sloppy with his research. He made some interesting points during the evening. Perhaps his most important was a downgrading of the study of the English revolution in schools both private and public. Like many who write on the Revolution Spencer had descendants who were active during the civil war.The windows in his chapel were rescued from another Spencer house that was burned down during the English Civil War. Another aspect of Spencer, the historian, is his openness to suggestions for future work from readers. His choice of subject for his latest book was in fact given to him by a reader. When I asked him a question about Ollards book and other historians such as the great Whig historians he made some interesting points. He saw himself as primarily as a narrative historian, but he believes that parallels exist between the past and the present. He is not reticent about describing his work as ‘popular history’. A Genre that that was mastered by historians such as Sir Thomas Macaulay, E. P. Thompson and A. J. P. Taylor. Spencer is not yet in that league, but his work does command serious attention and is well worth the price of his books. A review of To Catch a King will be done at a later date. Most of those who know of John Wilmot, 2nd Earl of Rochester have something of a preconceived image of him. While that image is not altogether false, Of Ink, Wit and Intrigue allows us to see a more rounded man and brings into the limelight the side of him that is usually cast in shadow. Here, Susan Cooper-Bridgewater has brilliantly shown how wrong it is to define anyone by reputation alone. The book is written in the first person, narrated by the earl himself. This is what really gives the readers insight. We get to feel his emotions, see events through his eyes and understand how and why he is who he is. The author was very courageous to make Rochester the narrator, but her clear familiarity with the period and subject himself enabled her to handle the challenge perfectly. There is some wonderful 17th-century phraseology to be found in this book, keeping us firmly embedded in the era throughout, but it never goes over the top, so is still easy to follow in a 21st-century head. The research that must have gone into this is astonishing. The author has had academic work published but this book uses the information in an imaginative way. Tale upon tale is told with amazing detail and many of the locations themselves are described so vividly that it seems likely the author has visited them to get that feel for them. Adding extra feel is the picture of the 17th century that’s painted throughout. Through the food, the carriages, the clothes, the theatre and the medicine, we get a real taste of life in Restoration England. Enthusiasts for the period will recognise many of the names that pop up and the number of dates that are given are proof of just how much painstaking effort must have gone into getting the facts right. As well as fact, though, this is partly fiction, and it’s impossible to tell which is which. In his all-too brief life, Rochester got up to some pretty shock-inducing stuff, so what may seem fabrication is just as easily truth and vice versa. As can be expected from this infamous rake, he self-indulges in wine and women to a professional standard, but he certainly has a few other tricks up his sleeve too. Even people who aren’t into history will find plenty to entertain and, despite the joy of seeing the lesser-known aspects of Rochester, the accounts of his famous “bad boy” behaviour do not disappoint! However, it is Rochester as a father, husband and lover that makes this book stand out most for me. Through his sensitivity as all three, we see the John Wilmot that surely existed but is never properly acknowledged. 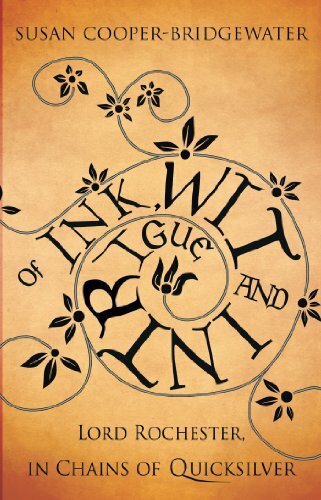 As promised, there’s ink, wit and intrigue and the intrigue is provided to a T in the epilogue, which takes us right up to Georgian times. I don’t know quite how she did it but Susan Cooper-Bridgewater managed to change the atmosphere to match the new era, so, as well as the Restoration fans, anyone into the 18th century will find something here for them too. A book to do His Lordship proud! I reckon he’d love to read it, but so should everyone else. A History of Print and Printing Tuesday 27 February - Tuesday 27 March- Bishopsgate Institute- This course looks at the history of print and printing in its social, economic and cultural context, exploring: the problems faced by early printers; the economics of early printing and how this affected the printed page; the social, legal and moral position of printers; the techniques of printing and the audiences for art prints; the technological developments of the nineteenth century, and the twentieth century revival of letterpress.